X Each time it hops, it makes a ringing sound. It deafens foes by emitting high-frequency cries. X Jedes Mal, wenn es hüpft, entsteht ein klingender Laut. Seine hohen Schreie machen die Gegner taub. X Il produit un bruit de sonnerie à chaque bond. Il assourdit l’ennemi avec ses cris à haute fréquence. X Emite un tintineo cada vez que salta. Ensordece a sus rivales con sonidos de alta frecuencia. X A ogni salto produce un suono che sembra uno squillo. I suoi versi ad alta frequenza assordano i nemici. X 뛸 때마다 딸랑딸랑 소리를 낸다. 높은 주파수의 울음소리로 상대의 귀를 들리지 않게 한다. Y There is an orb inside its mouth. When it hops, the orb bounces all over and makes a ringing sound. Y In seinem Maul befindet sich eine Kugel, die beim Hopsen ein klingelndes Geräusch erzeugt. Y Quand il sautille, l’orbe qu’il a dans la bouche s’agite et tinte comme une cloche. Y Tiene una esfera en la boca. Cuando salta, la esfera rebota y emite un tintineo. Y Ha una sfera nella gola. Quando saltella, la sfera si muove emettendo dei trilli. Y 뛰어오르면 입안에 있는 구슬이 사방에 반사되어 방울 같은 음색을 만들어 낸다. Omega Ruby There is an orb inside its mouth. When it hops, the orb bounces all over and makes a ringing sound. 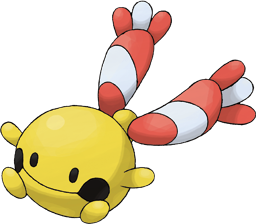 Omega Ruby In seinem Maul befindet sich eine Kugel, die beim Hopsen ein klingelndes Geräusch erzeugt. Omega Ruby Quand il sautille, l’orbe qu’il a dans la bouche s’agite et tinte comme une cloche. Omega Ruby Tiene una esfera en la boca. Cuando salta, la esfera rebota y emite un tintineo. Omega Ruby Ha una sfera nella gola. Quando saltella, la sfera si muove emettendo dei trilli. Omega Ruby 뛰어오르면 입안에 있는 구슬이 사방에 반사되어 방울 같은 음색을 만들어 낸다. Alpha Sapphire Each time it hops, it makes a ringing sound. It deafens foes by emitting high-frequency cries. Alpha Sapphire Jedes Mal, wenn es hüpft, entsteht ein klingender Laut. Seine hohen Schreie machen die Gegner taub. Alpha Sapphire Il produit un bruit de sonnerie à chaque bond. Il assourdit l’ennemi avec ses cris à haute fréquence. Alpha Sapphire Emite un tintineo cada vez que salta. Ensordece a sus rivales con sonidos de alta frecuencia. Alpha Sapphire A ogni salto produce un suono che sembra uno squillo. I suoi versi ad alta frequenza assordano i nemici. Alpha Sapphire 뛸 때마다 딸랑딸랑 소리를 낸다. 높은 주파수의 울음소리로 상대의 귀를 들리지 않게 한다. Diamond It emits cries by shaking the circular orbs around its neck. It moves by bouncing lightly. Pearl It emits a ringing sound every time it bounces. It deafens its foe with cries of very high frequencies. Platinum There is an orb inside its mouth. When it hops, the orb bounces all over and makes a ringing sound. 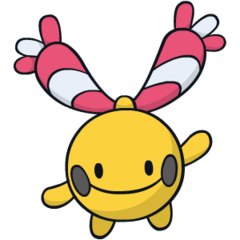 HeartGold It emits high-frequency cries that people can’t hear. Once it starts, it can cry for an awfully long time. SoulSilver It emits high-frequency cries that people can’t hear. Once it starts, it can cry for an awfully long time. Black There is an orb inside its mouth. When it hops, the orb bounces all over and makes a ringing sound. White There is an orb inside its mouth. When it hops, the orb bounces all over and makes a ringing sound. White 2 There is an orb inside its mouth. When it hops, the orb bounces all over and makes a ringing sound.